Lime and Jump go where no system has gone before. The North Shore of Staten Island doesn’t have any protected bike lanes on public roadways — but now it has hundreds of dockless Lime and JUMP bikes to rent by the half-hour. On Thursday, the city launched the second of its four-neighborhood bike-share test on Staten Island, where the two companies will share turf on the island’s northeast corner — from the ferry terminal to the Verrazano Bridge, plus a narrow stretch along the waterfront to Miller Field. Lime bikes are already operating in the Rockaways. Here’s Trottenberg (with Council Member Debi Rose at far left) on a Lime bike. Photo by DOT. Like other dockless systems, both Lime and JUMP rely on an app-based system for users to unlock and pay for rentable bikes. Lime’s regular bikes cost $1 for a 30-minute ride, with pedal-assist e-bikes costing an additional 15 cents per minute. JUMP’s bikes, which will all be battery assisted, are $2 per 30 minutes. The electric bikes become legal as of Saturday. 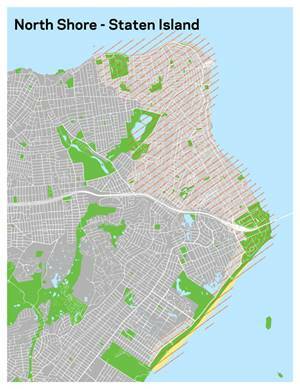 Rentable Lime and Jump bikes will be available in this area on Staten Island starting today. Map by DOT. Later this month, the bike-share pilot will expand to the area around Fordham University in the Bronx, with bikes provided by JUMP next week and, at some point, Citi Bike. Coney Island will get into the swing later this year after a dispute with the local community board. It will be interesting to see if the Staten Island pilot program will be a success, given the island’s car culture and limited bike infrastructure. Skeptics have pointed out that there may be too few bikes in the program to create the saturation needed for bike-share to function. Plus the bikes may require constant rebalancing because many people might use a bike to get to the Staten Island Ferry in the morning and to get home at night, but there are not likely to be many trips beyond those. As in the four other neighborhoods, the pilot program will be evaluated based on “safety, availability and durability of the bikes themselves,” DOT said in a statement. 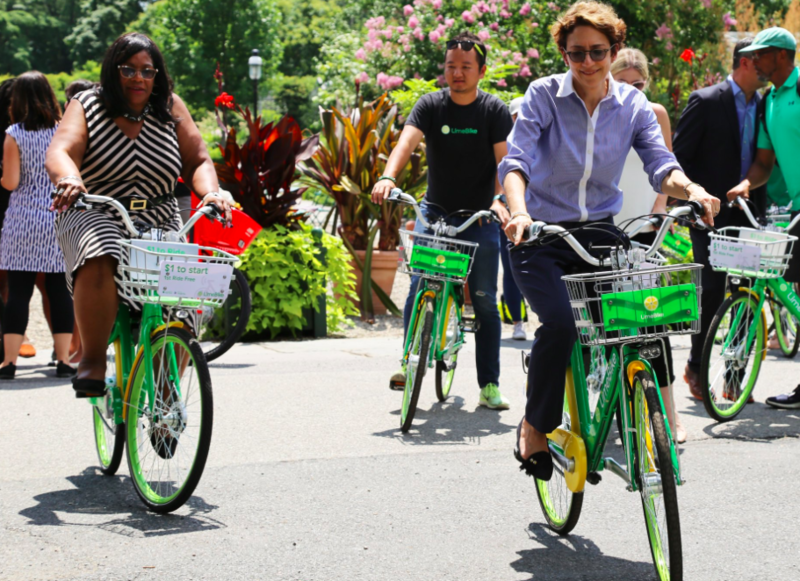 “I encourage my constituents to download the app and hop on a bike — and give your feedback so that we can ensure a permanent bike-share program that works for all Staten Islanders,” said Council Member Debi Rose. Is there any way to see where these bikes are? I can’t find them on the Transit app, the Jump app, or the Uber app. The Lime bikes are being rolled out first. Download the app to find locations. How easy is it for Citibike members to use these? I want a coherent bike system rather than a free-for-all of incompatible systems. Trottenberg. Do you morons ever thing further than your nose? NO. You don’t. I have never seen the rubbish from Jersey Street in my neighborhood until now on the pink and lime green bikes. Thanks Debi Rose you twit!!! Our editor tests two systems hoping to take on Citi Bike. Good luck with that. Customers will likely bounce from JUMP to its competitor, Lime Bike. Streetsblog was given access to some of Lime's user data.